Once upon a time, four girls in a group text decided to set one weekend aside for some magic. A bit less than a year later, they flew from four different cities to celebrate their friendship, and each other. Upon arrival to our resort - and squealing with delight once uniting with one another - we took in our sweet surroundings. 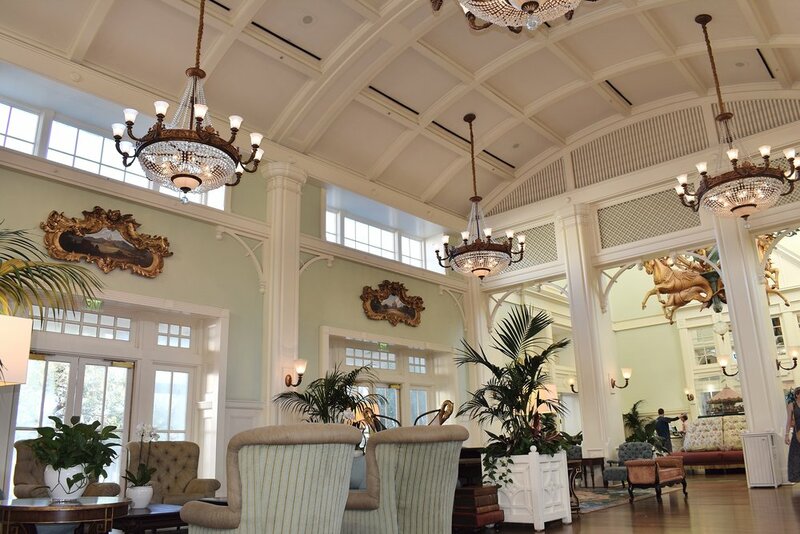 Disney’s Boardwalk Villas hold a special kind of old-fashioned charm that we found ourselves still discovering new pieces of, even on our day of departure. Admittedly one of my favorites on Disney’s Property, the ambiance is unmistakably reminiscent of sparkling old-world charm. Everything from the lobby decor, to an ice cream cone on the Boardwalk transports you back to a simpler time. After freshening up, we began our stay the only way we know how - Mexican food. Disney Springs has recently become a hub for all the things: Every kind of cuisine you could imagine, various forms of night-life, vintage amphicar and Italian water-taxi tours, Disney merchandise, a bowling alley, shopping the likes of Anthropologie, Zara, or Kiehl’s, a movie theatre, and even a cupcake ATM. Frontera Cocina is full of the most decadent, authentic Mexican Cuisine I have had in a long time - the three different types of guacamole on the menu were just the tip of the iceberg. The restaurant is positioned on a small pond, decorated with appropriate touches like colored lanterns and string lights. The colorful atmosphere is so beautiful and, in the evenings, it’s the perfect place to wind down after a day in the parks. *Ask for a table outside. There is something blissful about eating Mexican cuisine with friends and drinking a margarita (my favorite on the menu is the Play With Fire - a refreshing fusion of cucumber and jalapeño flavors), all while watching the sun go down. So, we did what we do best - dance out the tacos. scroll through a google search, and follow the promise of wine. Wine Bar George is one of my favorite finds from this trip. I sipped on their delicious, crisp New Zealand Sauvignon Blanc by Spy Valley - perfect for a warm, summer evening. Sarah really enjoyed an Oregon Pinot Noir by Argyle - Oregon, who knew? *This is another venue with lovely outdoor seating. While seated upstairs on the patio, when the weather is just right, you can enjoy a glass of wine, some cheese (let’s be honest), and a beautiful view of the water. The inside is rustic, industrial, and cozy featuring a beautiful large, wooden, antique staircase which I silently swooned over as we stepped upstairs. With 130 wine selections, carefully selected by Master Sommelier George Miliotes - even some on tap - there is something for everyone (even non-wine drinkers with 9 beer and ciders on the menu). While indulging on some late night sips and snacks, we planned our next morning. *Disney’s Boardwalk Villas are located perfectly in between two other resorts. Those, along with the tail end of EPCOT, surround Crescent Lake. If you’re like me and you like to get your body moving early in the morning, I highly recommend one of the Disney Resorts - a lot of them even have specific running trails. After getting ready in record time (especially for four gals only sharing two sinks - still proud of us), we ventured out to join the food and wine festivities. If you’ve never visited EPCOT during its acclaimed Food and Wine Festival, you must include it in your next visit. It lasts for 75 days and each country has its own kiosk containing a small portion of a delicacy specific to their little part of the world. There are even countless kiosks for countries (and Hawaii, because why not) which are not physically represented in the EPCOT’s World’s Showcase! *There is no shame in the budget game so, I recommend sharing each small portion between two people and maybe not making dining reservations that day. Each dish is usually under $10, but if you’re eating something in almost every country, those little bites add up. Thanks to the free mini-passports provided by the festival, we planned our route. It was so much fun trying new things together and exploring what each kiosk had to offer. I believe I’ve met my soulmate, and his name is spanakopita. Later that evening (post-siesta), it was decided that an actual meal was in order. In a truly magical moment of not having to wait more than twenty minutes for a table with no reservation, we sat down at Chefs De France. This restaurant is a favorite for all four of us, and if you’re planning to spend some time in EPCOT on your visit to Disney World, their lunch and dinner menus are worth every penny. After dinner and back at the Boardwalk, we found ourselves just outside of the Atlantic Dance Hall that was bumping with music I shamelessly swayed to during my sixth grade dance - looking at you, Usher. Boardwalk’s Atlantic Dance Hall is a large art deco ballroom that comes to life once the sun goes down, (for guests 21 and older). It’s equipped with a full bar and huge dance floor where we sweat out every inch of the food from that day, dancing to everything from MJ to The Spice Girls to Taylor Swift. Dressed to the nines, in harvest decor of course, she’s never looked prettier - or more autumnal. Disney does decor so well, and if you have the opportunity to visit during this season you should absolutely go - everything from the lamp posts to the topiaries are completely darling. As we walked through the park, the need for breakfast became just that: a need. Although there are plenty of options right on Main Street (even a Starbucks! ), we decided to head to the newer part of Magic Kingdom. The newest part of Fantasyland is my favorite because one of my favorite Disney Movies is Beauty and the Beast. Sitting in the Enchanted Forest area eating a chocolate croissant and drinking coffee, while listening to the film score play in the background is truly my idea of heaven. I have so many happy memories at Magic Kingdom. Over the years, I remember watching parades and shows, riding Splash Mountain for the first time, and sharing a cup of ice cream from the Plaza Ice Cream Parlour with my Dad, as the three of us enjoyed the fireworks before heading home. I always try to make visiting Magic Kingdom a part of my stay - even if it’s only for an hour or two. With technology so prevalent in society, I feel very strongly that it’s less about what you do, and more about who you’re with. Especially when you plan a trip to Disney, make sure you’re leaving time to invest in each other. It’s so easy to get swept up in doing things (like making sure you get to your fast pass reservation on time or getting a good seat for a show). Before you know it, you’ve spent the whole week together riding rides and watching fireworks without barely any real conversation. Keeping with the siesta theme, we quickly made it back to our room, changed and headed to the pool. This was another favorite moment of the trip for me. I love girl chat, especially with my nearest and dearest. These girls are my heart and my family - and I wouldn’t have wanted to spend three days building these memories with anyone else. we also spent our Sunday the only way millennials know how - brunch. The Best Meal Award, goes to Chef Art Smith’s Homecomin’. I like to think I have some pretty high standards for brunch and this one was unreal. Chef Art Smith is actually the very first Disney College Program Graduate to have a restaurant on Disney Property - hence, the nostalgic name. While sipping on the Garden Mary (maybe the best I’ve ever tasted) we took in the adorable “Upscale Down-South” atmosphere. I really loved this restaurant because it celebrates the local Florida agriculture by serving farm-to-table cuisine - and it’s to die for. Pictured: Hushpuppy Benedict, sans fried chicken. They have an entire menu full of crafted cocktails and moonshine on tap. We even had a delightful server named Brian who was a wealth of knowledge and so helpful when choosing what to order - which was way too much food, but so worth it. After what felt like the longest carb-coma I’ve, personally, ever experienced and getting a jumpstart on packing, we headed out to meet a friend of ours, Laura, for dinner. Laura and her boyfriend, Bart, were vacationing in Disney the same weekend - my favorite kind of coincidence - and we had made plans to meet up and grab more (you guessed it) Mexican food. There really is no such thing as too much chips and salsa. They ordered dinner and we snacked on some very-small-post-gigantic brunch-plates in Mexico’s San Angel Inn Restaurante. The charming atmosphere is modeled after a 17th-century hacienda near the Mayan Ruins. It’s pretty dimly lit, so I’d recommend making a reservation for dinner (the ambiance is more fitting). They also have a full spread of different tequilas, Mexican beers, and margaritas available for guests 21 and older. While walking back to our resort, we heard the music begin for Illuminations. If you’ve never experienced the magic and beautiful message that is this spectacular fireworks display, do yourself a favor and just stand still, keep your phone in your pocket, and take everything in. The message of togetherness and unity is so touching, especially in today’s world, and visually, it’s so stunning. It was the perfect way to end our weekend together. Whether you’re experiencing the different cultures and cuisines of the eleven countries in EPCOT, riding the Kilimanjaro Safari in Animal Kingdom, or spending a beautiful evening watching the fireworks from the roof of your resort, Disney can be a vacation for all ages. *but it’s especially fun with your nearest and dearest.